AMONG THE LOWEST PRICES ANYWHERE FOR WISDOM TEETH REMOVAL IN SYDNEY BY CONCENTRATING ON THIS SINGLE ASPECT OF DENTISTRY. Our Wisdom teeth removal price is affordable to one and all and hence we are the best choice for wisdom teeth removal in Sydney. We also provide our patients with Payment plans is available with a variety of payment options that includes all major credit cards and health plans which can reduce teeth extraction cost and the Wisdom Teeth removal Cost in Sydney. General Anaesthesia and IV Sedation is sometimes necessary or requested. 85% Medicare rebate applies to most treatments when patients may pay as little as $75 to have the removal of 4 Wisdom Teeth in the clinic or excellent accredited hospitals. IT WOULDN'T HURT TO HAVE A FREE SECOND OPINION OR QUOTE BEFORE ANY SURGICAL PROCEDURE. Most of Surgical Wisdom Teeth Procedures are performed in our clinics. We also perform surgery under general anaesthetics in different hospital and day surgeries in Sydney. If it is decided that your case needs to be performed in the Hospital by your choice or by the surgeons recomendation additional fees may apply by Anaethetists and different accredited hospitals or day surgeries. You will probably be surprise with how low you will pay compared to your previous quote. Wisdom Dental Emergency has estabilish excellent fees with different facilities over the past decade in Sydney. Hospital Costs depend on whether you have private health insurance and which city or hospital is chosen. If you have private hospital cover (and have had it for more than 12 months) then most health funds will fully cover the cost of the hospital stay. Additionally, there will be a bill from the anaesthetist. Medicare (and possibly your health fund) will cover a proportion of this bill, however, there could be a gap of approx $250 that you will need to fund. You will find the same fees and Wisdom Teeth Removal price at The Wisdom Teeth Professionals website. Why Wisdom Teeth Removal Is Recommended? Located at the very back of your upper and lower jaw, the third molars are considered as the source of trouble in most cases. You brush and floss you teeth daily, no cavities, no missing tooth, but still, at some point you may feel your jaw hurting or throbbing. After a deep examination, you may discover that the problem is due to wisdom teeth. Does all wisdom teeth cause problem? No! Only the ones that are impacted or crooked can be painful and cause problems with chewing, swollen gums, infection, and damage to neighbouring teeth. This is because wisdom teeth growing in your late teens or early twenties do not have enough room in your mouth. Hence, it gets stuck in your gums and is unable to reach its normal position. These partially impacted wisdom teeth can cause cavities and gum disease because they are more difficult to clean. They are easily contaminated with bacteria and easy for food to get trapped. This leads to dental complications like plaque, cavities, and gum disease. Some wisdom teeth will not show any pain or visible complications, but may cause trouble in future. Depending on the number of wisdom teeth to be extracted, the cost of wisdom teeth removal in Sydney may vary. Consult your oral surgeon to learn in detail about the entire wisdom teeth removal process and get yourself prepared for the procedure. Based on the complexity of the procedure the duration of the removal process and healing time may vary. In general, wisdom teeth removal procedure is done under anaesthesia which is helpful in relaxation and reducing pain during the procedure. Advanced treatment options and tools are used to cut the bone and tooth. After the removal process the gum and bone are left to heal. Here, we’ve compiled a list of aftercare tips to avoid infection after the wisdom teeth removal process. Bite gauze pads firmly over the surgical area for 30 to 60 minutes and discard it later. This makes sure that no bad bacteria have an environment to grow and cause a wisdom tooth infection. Before placing a new gauze pad over the surgical site, be mindful to clean the old clots to encourage the new clots to form. Rinse your mouth using warm salt water to ensure that the surgical area stays clean. Begin salt water rinses 24 to 48 hours after the surgery because doing so the earliest could dislodge the clots formed. Resume your daily activities two or three days after the wisdom teeth surgery. Talking complete rest for more than 48 hours gives you enough time to recover from your dental surgery, and be fully ready to fight off any potential sign of infection. Place ice packs against the swelling side of your face to reduce inflammation and bleeding. Consume foods that are easy to swallow and say no to crunchy vegetables and fruits. Avoid straws to drink fruit juices or water because it causes blood clots to dislodge and make it easier for infection to occur. For more advice on dental care and find cheap wisdom teeth removal in Sydney, call 1300 217 858 and book an appointment now!!! List the average wisdom teeth removal cost in Sydney Depending on the specific needs of the patient undergoing wisdom teeth removal, the average cost may vary. The cost of tooth extraction due to the damage caused by wisdom teeth is between $150 and $350. For simple wisdom teeth removal without any complex procedures, the cost is $250, and for surgical wisdom teeth removal, the cost is between $250 and $375. The cost for removing four wisdom teeth will never cost you more than $970. Where can I find cheap wisdom teeth removal in Sydney? At Wisdom Teeth Removal Sydney, we offer some ways to keep the cost of wisdom tooth removal as low as possible. They not only offer low fees covered under many fully disclosed payment plans, but each patient is treated on a case by case individual basis, using the latest and highest quality treatment possible that’s gentle and safe. The cost of a simple dental check-up and clean is $159, and this includes the cost of digital x-ray, polish and fluoride treatment. The cost of simple wisdom teeth removal is $225, and the total cost of removing all four wisdom teeth is within $970. When is the best time to have my wisdom teeth removed? The optimal time to remove your wisdom teeth is before turning 18 or 20. Wisdom teeth removal at this age results in faster recovery, and safe & more predictable intervention. Moreover, getting your wisdom teeth removed early prevents the issues that can occur in the future allowing patients never to experience the potential consequences of problematic third molars. How long does the bleeding due to wisdom teeth removal last? Most of the times, the bleeding is controlled during the intervention or by applying cotton gauzes at the end of the procedure. For the first few hours, a minimal oozing is present after the surgery, and the use of cotton gauzes is sufficient to stop the bleeding. List some tips to find affordable wisdom teeth removal in Sydney Wisdom teeth removal is a simple surgical procedure but involves high cost when there is more complexities. Here we have listed some affordable wisdom teeth removal options. Get discount dental plans from dental offices that offer you significant savings. With a discount dental plan, you can save money anywhere between $200 and $500. When you face out-of-pocket costs, your dental insurance will cover the cost. In some cases, your medical insurance may cover a portion of the procedure while in others it allows the dentists to charge whatever they want for more complex procedures while controlling the costs of more simple needs. Discuss with your dentist about a payment plan to make wisdom teeth removal cost in Sydney more manageable for you and your family. Some dentists may to break up the payment over several months instead of paying for the procedure all at once. How much does wisdom teeth removal costs in Sydney? The cost of wisdom teeth removal in Sydney is affordable and there are different payment plans available with a variety of payment options that includes all major credit cards and health plans. Here we’ve listed the approximate cost for wisdom teeth removal. The maximum cost for all 4 surgical wisdom teeth removal is $970. How much of the wisdom teeth removal cost in Sydney does dental insurance cover? Generally, dental insurance may cover up to half the cost of wisdom tooth removal in Sydney. Depending on the type of the plan and the insurer and policy, the coverage may vary. If you don’t have any particular insurance, then the dental clinic may have payment plans to reduce your burden. What are the factors that determine the cost of wisdom teeth removal? Depending on the following factors, the cost of wisdom teeth removal may vary. Where can I find cheap wisdom teeth removal in Sydney? Dr Paulo Pinho, the leading dental surgeon in Sydney employs advanced dental procedure and techniques to remove wisdom teeth. Since 2005, he has limited his practice to dental emergency, tooth extraction and wisdom teeth removal surgery in Melbourne and Sydney. 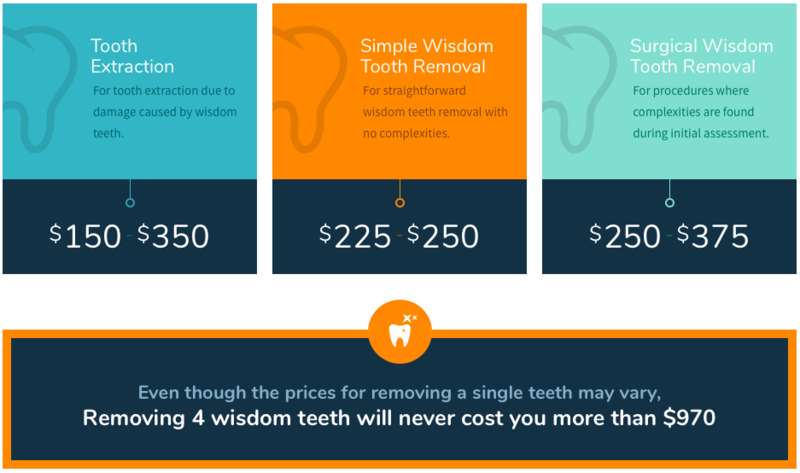 The cost of single wisdom tooth removal ranges from $225 to $375 and 4 wisdom teeth removal is $970 only. The procedures are performed under extreme care and safety by a highly qualified dental surgeon with practise limited to oral surgery and Wisdom Teeth Removal. What questions should I ask to my oral surgeon before getting wisdom teeth removal? Ask the following questions to your dental surgeon to help put your heart at ease. How long is the extent of wisdom teeth extraction procedure? What is the cost of the wisdom teeth removal in Sydney including overhead costs? Is the cost of the wisdom teeth procedure covered by dental insurance? What are the payment options available to reduce the Wisdom Teeth removal Cost in Sydney? Are there any major risks involved in the wisdom teeth removal process? List a few tips to reduce the cost of wisdom teeth removal in Sydney? Here are a few wisdom teeth removal options that can reduce the financial burden on you. Find a discount dental plan which offers you significant savings on your wisdom teeth removal procedure. These discounted dental plans can help you to save $60 and $200 per tooth depending on the type of extraction you need. Determine how much your dental insurance can save you on the wisdom teeth removal procedure and plan accordingly. Talk to your dental surgeon in Sydney to decide on a payment plan that can make the cost more manageable for you. How to recover quickly from wisdom teeth removal in Sydney? Due to tenderness and swelling, the aftermath of wisdom teeth removal is more painful and stressful. Here are a few tips to quickly recover from wisdom teeth removal. Why should I take my wisdom teeth out? You should opt for wisdom teeth removal in Sydney, if you are suffering from any one of these reasons. Any surgical or invasive procedure carries risks. Before proceeding, you should seek a second opinion from an appropriate and qualified health practitioner.